BMW began building motorcycle engines and then motorcycles after World War I. Its motorcycle brand is now known as BMW Motorrad. Their first successful motorcycle, after the failed Helios and Flink, was the "R32" in 1923. This had a "Boxer" twin engine, in which a cylinder projects into the air-flow from each side of the machine. Apart from their single cylinder models (basically to the same pattern), all their motorcycles used this distinctive layout until the early 1980s. Many BMWs are still produced in this layout, which is designated the R Series. During the Second World War, BMW produced the BMW R75 motorcycle with a sidecar attached. Featuring a unique design copied from the Zündapp KS750, its sidecar wheel was also motor-driven. Combined with a lockable differential, this made the vehicle very capable off-road, an equivalent in many ways to the Jeep. In 1983, came the K Series, shaft drive but water-cooled and with either three or four cylinders mounted in a straight line from front to back. Shortly after, BMW also started making the chain-driven F and G series with single and parallel twin Rotax engines. In the early 1990s, BMW updated the airhead Boxer engine which became known as the oilhead. In 2002, the oilhead engine had two spark plugs per cylinder. In 2004 it added a built-in balance shaft, an increased capacity to 1170 cc and enhanced performance to 100 hp (75 kW) for the R1200GS, compared to 85 hp (63 kW) of the previous R1150GS. More powerful variants of the oilhead and hexhead engines are available in the R1100S and R1200S, producing 98 hp (73 kW) and 122 hp (91 kW), respectively. 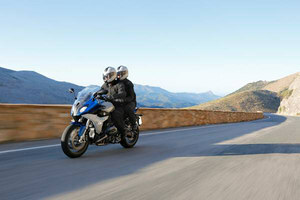 In 2004, BMW introduced the new K1200S Sports Bike which marked a departure for BMW. It is both powerful (the engine is a 167 hp (125 kW) unit derived from the company's work with the Williams F1 team) and significantly lighter than previous K models. It was BMW's latest attempt to keep up with the pace of development of sports machines from the likes of Honda, Kawasaki, Yamaha, and Suzuki. Innovations include a unique electronically adjustable front and rear suspension, and a Hossack-type front fork BMW calls Duolever. BMW was one of the earliest manufacturers to offer anti-lock brakes on production motorcycles starting in the late 1980s. The generation of anti-lock brakes available on the 2006 and later BMW motorcycles pave the way for the introduction of sophisticated electronic stability control, or anti-skid technology – a first for production motorcycles – later in the 2007 model year. BMW has been an innovator in motorcycle suspension design, taking up telescopic front suspension long before most other manufacturers. Then they switched to Earles Fork, front suspension by swinging fork (1955 to 1969). Most modern BMWs are truly rear swingarm, single sided at the back (compare with the regular swinging fork usually, and wrongly, called swinging arm). Some BMWs started using yet another trademark front suspension design, the Telelever, in the early 1990s. Like the Earles Fork, the Telelever significantly reduces dive under braking.